For me the reading encapsulates what I think of whenever I hear the name of St. Joseph. St. Joseph is the icon of everyone who works to support a family. Ever since my conversion I've been told that St. Joseph is a powerful helper for families in need. Certainly, we would do well to seek his intercession for us. For anyone who has ever faced a difficult situation at work, or a difficult situation concerning his or her family, St. Joseph is the saint par excellence to whom we look for help. We look to the justice seen in St. Joseph in a time when work often does not provide for the minimal needs of families. The injustices are glaring when we consider the inequity that exists in our world. St. Joseph stands for all who have struggled to make ends meet, but even more he stands for those whose work fails to conform to the most meager of standards. Thus, St. Joseph is the true patron of the worker. It is he to whom we must look as we consider the needs of those loved ones our Lord has entrusted to us. The justice of St. Joseph exemplifies the trust in God that we are to strive toward. 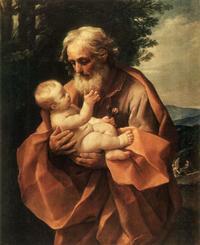 If ever there were a situation that tested one's ability to trust, St. Joseph faced it. He chose, rather than listening to the voices around him, to trust what God had revealed to him; that is, he chose to trust in the holy and sanctifying providence of God. He surrendered all his human will to the will and purposes of the Almighty. As I prepared to retire to my room for the evening I caught a glimpse of a little icon that has hung on my bedroom wall since my first child was born. It depicts a young looking Joseph with a little blond boy holding a cross that he fashioned from his daddy's wood scraps. Many times my wife has reminded me that it is her favorite of my "holy pictures," which I've collected over the years and hung in various places around the house. I know that what she expresses when she tells me that it is her favorite is something deeper than words--it's a fundamental relationship, one that marriage shows us clearly. It is a communication of the depth that God chooses to have in the human exchange between spouses. She looks to Joseph because she looks to Joseph in me--no less than many miracles have taken place in my life, in my family, because a greater power watched over us. I must confess, I have not always seen St. Joseph in the light I now see him. However, being a husband, a dad, and a worker brings me a little closer to him. Facing doubt and uncertainty also brings St. Joseph into focus in my life. No, there's not really any fear when we trust God--thankfully we have a wonderful model who is able to "direct our way to heaven. St. Joseph, be our guide!" It seems like this post on St. Joseph almost encapsulates everything you've been teaching us recently, dd, and the reading from Colossians also ties in so closely with your last post. I have learned much this year about St. Joseph from other bloggers as well as here, and how important a role he can play in our lives. Maybe it is Joseph's time, at last. A wonderful post, DDW. As always. You've given me a new insight to St. Joseph.